How is everyone? I am exhausted and sure hope I get caught up on my sleep soon. I have so much going on this week with some commitments due soon and trying to get the laundry and other things caught up around here. I am a just a wee bit cranky, but sure I will snap out of it as soon as my sleep gets caught up. Seems we always need a vacation after going on a trip even though it was a short one we were go, go, going all the time. I wish this thing really worked so I could just push it and all my stuff will be magically done. Anywho, let's get on with this party. There were lots of great links last week that I glanced through to choose a few features. This hilltop kitchen garden by Entertaining From an Ethnic Indian Kitchen will blow your mind. You should see the view they have, too. Nice and bright laundry room makeover by Life on Virginia Street. Check out this DIY upholstery tutorial by At Home on the Bay. I love the finished look. 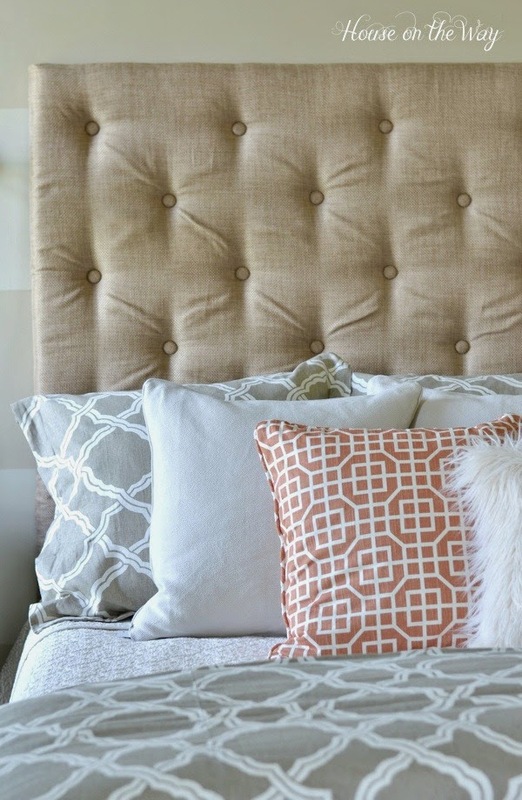 Find out how to make your own tufted headboard, too by House on the Way. Home is Where the Boat Is shared this pretty in blue bottles vignette. I enjoy a smoothie every morning and I am adding this one by Roxy's Kitchen. 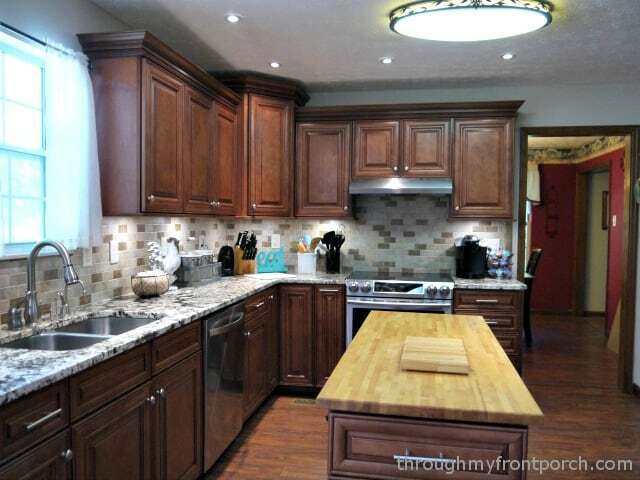 The most viewed link last week was this kitchen reveal by Through My Front Porch. Thanks so much to everyone who joined last week. If you were featured please grab a featured button from my sidebar. I always feel like I need a vacation after my vacation and often after a short trip too! Thanks so much for hosting! I know what you mean about feeling a little cranky...I'm feeling that way this week too so much going on with school...thankfully we have a long weekend coming up! Thanks so much for hosting! It always takes me a while to get back to normal after a vacation - even a mini one! Thanks for hosting! That smoothie look wonderful! Thanks for hosting. I linked my backyard before and afters. hi Kim, I need a vacation during my vacation! We are landscaping and redoing at our beach house and the hubs is about to kill me because its the opposite of relaxing! I do appreciate your party, and hope you get some rest and help with the laundry! Thank you for featuring my sofa update, Kim! Welcome home from your lovely weekend! You are looking wonderful! Thanks for hosting each week, Kim. Have a good one! Kim, I know you must be tired! Looks like you and Shirley had a wonderful trip. I think it's awesome that your husbands made the trip, too! I'm so glad to be here tonight! I've been slowly but surely working on my kitchen and I FINALLY finished the island. I'm so happy with the way it turned out, and I'm excited to share it here. Thank you for hosting a wonderful party! Amazing features, as always. I'm totally jealous of that laundry room with the fancy light fixture! Thanks for hosting and have a fabulous week!!! Oh, I know what you mean by catching up! Thanks for taking the time to host, and showing some great features, Kim. Kim, I love Lucketts and I bet you and Shirley had a great time. Looking forward to seeing what you brought home. Thanks for hosting. If you find a button like that that actually works, pass it my way when you are done. I could really use an easy button! Thanks so much for hosting! Thank you for featuring my kitchen remodel , Kim. I am so excited.Your trip sounds like so much fun. Can't wait to hear more. Oh, the unpacking and laundry thing after a trip is awful! yeah, get lots of sleep and then you'll going to feel better ;) Thanks for hosting us! Hope you get some rest soon and feeling back to normal Kim, thanks so much for hosting this awesome party! I always feel like I need a vacation after my vacation too! Thanks again for hosting! Merci d'avoir pris ce temps précieux pour ce joli billet de partage. I love a vacation! Hope you feel rested soon. Thanks for hosting! Those short little vaca can leave you feeling drained! Hope you can catch up on your sleep soon. thanks for hosting! I will take one easy button and one of those pineapple smoothies - I think you have the cure for everything right there for us! Hope you get some rest! Thanks for hosting. Kim, when you finish with that EASY button, would you please pass it on to me? I have multiple projects with deadlines to finish! As always, thanks for hosting! 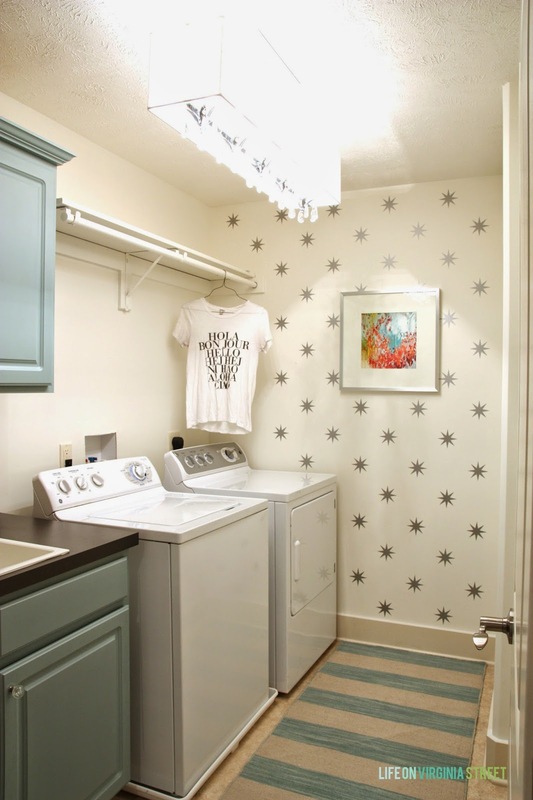 Thank you for featuring our laundry room! Hope you had a wonderful vacation! I bet you are pooped! But it looks like you had a fun getaway and got lots of goodies. Thanks for hosting! It feels great having a project!!! Thanks for hosting! Love the blue bottle vignette. Thanks for hosting, Kim, and I hope you feel rested soon. Sounds like you had such a fun trip, get caught up on those zzzzzz's. thanks so much for hosting, Kim! Thanks a bunch for hosting the party, Kim! Great piece of writing, I really liked the way you highlighted some really important and significant points. A little late to the party!....Wish we all had an "Easy Button"....great features...and thanks for hosting! Love the party, thanks for hosting week after week. Always so many inspiring things. Oh and I hope you get some sleep soon. I know how you feel! Thanks so much for hosting, Kim! Good luck with all your to-dos. They seem never-ending at times, don't they? Have a wonderful day! Hi Kim! Thanks for hosting, I'm a little late this week. I hope you are enjoying all of your Luckett's finds. Shirley said you did a lot of shopping and found some great things! So sorry I could not join you... we were celebrating Mother's Day that weekend. Now off to do some visiting! Hi Kim, I am new to Wow us Wednesday and wanted to take a minute to say hello. So many wonderful links to look at. Thanks for hosting! I'd love to have one of those easy buttons too:) Thanks for hosting every week! I could sure use that easy button right now. ;) Thanks so much for hosting. Thank you so much for your tireless hosting :). I love the tufted headboard and the smoothie sounds delicious. Thanks so much, I appreciate your work.And finally it ended with such a nice blog post. Hi Kimmie! What a party. I'm so glad to be playing along, even though I'm a little bit late! Don't kick me out! ;0 Thanks always for hosting.